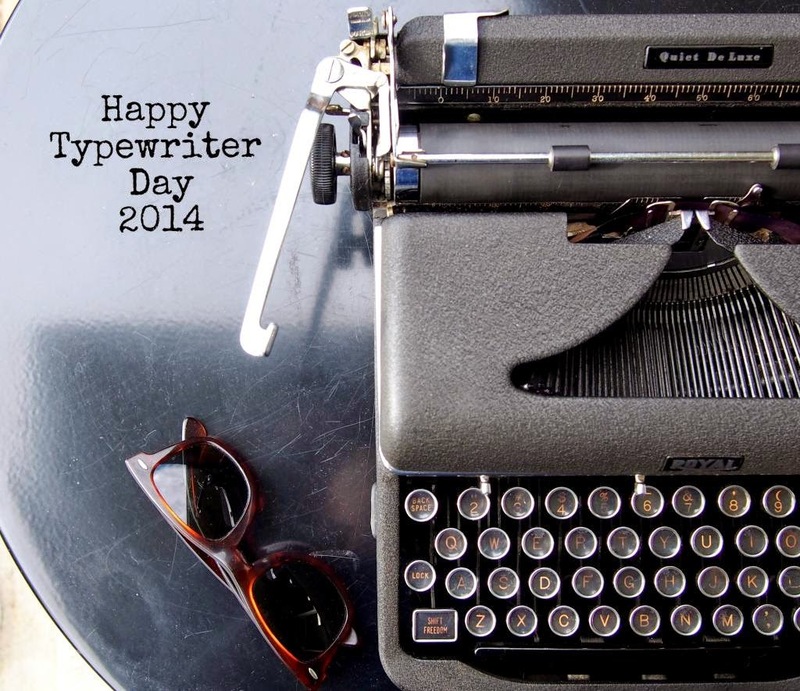 THE TEERITZ AGENDA: Typewriter Day 2014 - Miserable Weather, But The Heater's On And I Have A Quiet De Luxe. Typewriter Day 2014 - Miserable Weather, But The Heater's On And I Have A Quiet De Luxe. Awful weather we're having here today in Melbourne. Cloudy, windy and the rain threatens to let rip at any moment. Good day to just stay indoors with the heater on, a cup of tea or coffee, and a good book. Although, I'm not sure I'm in the frame of mind to tackle something so literary right now. Still, it's a short book. I got this copy from a nearby thrift store for two bucks. It belonged to a Year 12 student and he used an orange highlighter throughout it. Whatever happened to the days of a plain 2B pencil? More importantly, whatever happened to the days of keeping a book? I hope he got a decent mark for his book report, given all of the notations scribbled along the margins. With a fine-point Texta (Magic Marker). Have a great Typewriter Day, all! Nice! And the sunnies are giving them an extra sense of cool. I like your style. I've been out and about everywhere on the motorbike today. And can I just say, I got back home a minute ago to a heated house - and I'll be stuffed if I'm going to leave it until Miss J comes home with the car this afternoon. And yes... I have been rained on. ARG! That's a great QLD you have there. I always like seeing it out. Fantastic choice of machine to use today. Great photo montage. I'm always amazed at the seasonal differences between the two hemispheres. Right now, I could use a bit of rain and cold! Happy typewriter day! Just starting to hot up for summer here, so I guess about the same as an Ozzie winter :-) Still missing a QDL but my O stood me in good stead today. How (I mean HOW) did they make machines that good back then? Happy WTW Day! Hey! It is storming around the world! We've been experiencing much the same here in Florida. Clouds, winds and heavy rain. Made for a wet typewriter day. At least the rain did stop enough so I could change a tire. Hope you had a good typewriter day. Happy Belated Typewriter Day! I hope winter starts treating you better. Your weather sounds like Johnstown, where it rains 9 days out of every ten, unless it's between Oct. 1 and May 30th. Then it just snows. Smith-Corona Skyriter - Worth Going For? I'm Adding Word Verification To Combat Spam.